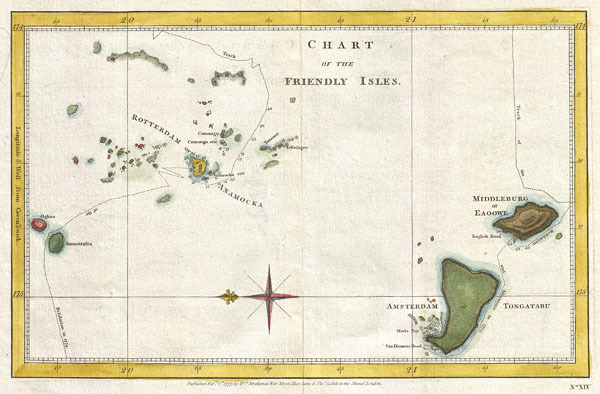 A highly uncommon chart of the Friendly Islands, or Tonga, from 1777. Oriented to the East, this map depicts the Tongatapu Island Group and the Ha'Apai Group that make up the Kingdom of Tonga. Shows the routes of the Resolution and the Adventure on Captain Cook's second voyage, 1772-1774. Cook's second voyage was intended to discover the apocryphal Terra Australis a theoretical southern continent that is not to be confused with Australia or Antarctica. On this voyage Cook crossed the Antarctic Circle and nearly, but not quite, spotted the Antarctic mainland. He landed at the Friendly Islands and laid on this map on the return portion of his voyage in 1773 and 1774. Published in 1777 by Thomas Cadell of London. Cook, James, A Voyage towards the South Pole, and Tound the World. Performed in His Majesty's ships the Resolution and Adventure, in the years 1772, 1773, 1774, and 1775, 2nd edition, London: Printed for W. Strahan; and T. Cadell in the Strand, 1777. Rumsey 3404.018. David, A., The Charts and Coastal Views of Captain Cook's Voyages, 2.111A. National Library of Australia, Map Collection, Rex Nan Kivell Collection Map NK 2456/54.